Some of you may have heard of the green building certification system known as LEED (Leadership in Energy and Environmental Design) developed by the U.S. Green Building Council, a private organization that even though it calls itself non-profit, functions as en effective cash cow for its founders. LEED is essentially greenwashing for the one percent to feel good about themselves even as they tear the fabric society apart. It’s yet another meaningless credential so that we can pretend our system is sustainable. What’s my evidence? a new development at the mineta san josé international airport (SJC) will break ground in january, where private aviation firm signature flight support has been granted rights to build and operate a $82 million private development on 29 acres on the airport’s west side. the company will service and provide a new site for the personal aircraft of the principals at google, as well as other clients in the silicon valley such as hewlett packard. 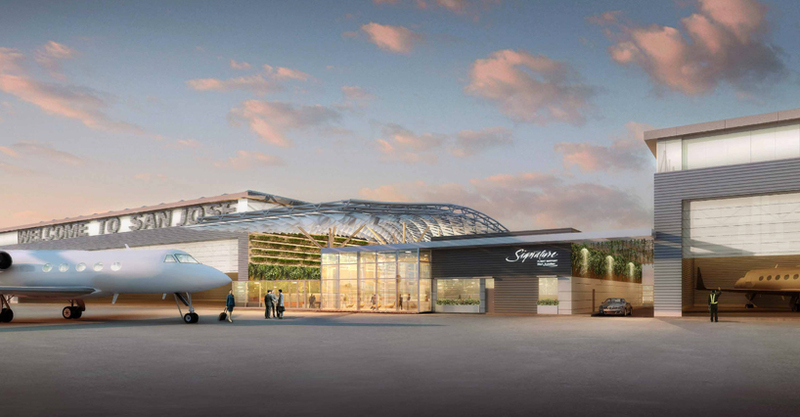 designed by gensler architects, the 270,000 square foot LEED gold-certified facility will feature an executive terminal, hangars, aircraft servicing resources and ramp space for accommodating large business jets such as the boeing’s 737 business jet and boeing B767. in addition, the airport extension will create economic stimulation to the region by opening up 150 to 200 construction jobs and offering the SJC $2.6 million in annual rent. Almost 200 jobs constructing a private jet facility for Google executives, eh? Someone call Tom Friedman! I guess the wealth is finally trickling down after all. Does it get more "green" than a spaceport for the one percent in the middle of the desert? 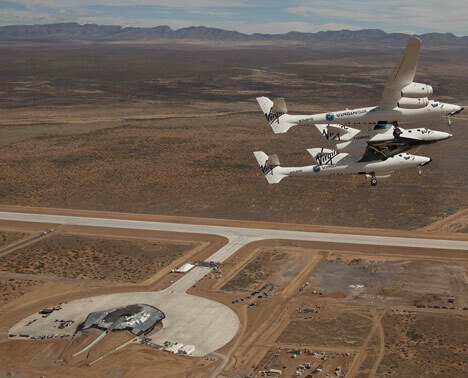 The Virgin Galactic Gateway to Space, a combined terminal and hangar facility, will support up to two WhiteKnightTwo and five SpaceShipTwo vehicles. The 120,000 square-foot building has been designed by Foster + Partners, working with URS Corporation and New Mexico architects SMPC.The Gateway will also house all astronaut preparation and celebration facilities, a mission control centre and a friends and family area...With minimal embodied carbon and few additional energy requirements, the scheme has been designed to achieve LEED Gold accreditation....Built using local materials and construction techniques, it aims to be both sustainable and sensitive to its surroundings. Do these projects seems like environmentally responsible green building projects designed for a world with less energy and a changing climate to you? An additional benefit of this fluid design approach is that the ridges draw a natural breeze indoors, providing an energy efficient cooling system for building users. The development has received LEED Gold certification for its employment of natural lighting and air purification systems, as well as intelligent building design. This perception of the elements eroding natural forms is continued to the four smaller buildings found south of the two main towers. These office blocks have been shaped to resemble river stones, washed smooth and rounded over a long period of time. Look, if you want to make a bunch of glass buildings look like ancient Chinese cliffs and river-washed stones, I have no problem with that. Go for it. What bugs me isn't the design itself, nor the cost, but the dishonesty. If you want to indulge in design fantasies and stand out from the crowd, that's your prerogative, but don’t pretend that you’re somehow being "environmentally friendly" by going for a credential like LEED. Who are you fooling? And I like the part at the end about air purification systems – necessary because of China’s infamous air pollution. So your building can get green credits by screening out the air caused by the coal-fired power plants fueling all the economic growth (which generates more building, etc.). Finally, I’ll outsource this one to Lloyd Alter. The big European engineering and manufacturing powerhouse, ABB, is making a push into residential markets with their LivingSpace program, full of home automation, security and more. They show a truly lovely piece of architecture on the site (sorry about the nav button being there), a see-through glass box with some nice shades too. But somehow it doesn't seem appropriate to use it as a model for "Reducing the energy consumptions of our homes." It is a beautiful site with unusual navigation that works well once you figure it out that things go sideways when you slide your finger down, but McLuhan said that the medium is the message, and the medium here is this big honking house. What's the message? That instead of building a house with walls, ABB will sell you "heaters, air conditioning, lights and blinds that automatically work together to create a comfortable atmosphere while minimizing energy to the max." Perhaps I just don't understand advertising. I would have thought that anyone who cared about energy consumption would immediately ask themselves "why would I consider living in a place like that?" or "how much do I have to pay ABB to make that glass box comfortable?" Actually, the message is clear and is the same as the three LEED projects above - "green" is a way for the job creators in their gigantic mansions to feel good about themselves and the direction society is headed. Thus, the one percent can live in giant gizmo-filled “green" homes and jet off into space from their “green” spaceports while the rest of us are forececlosed upon and living in tarpaper shacks or under bridges. But I guess our low-impact lifestyle won't count as "green" will it? Welcome to the “green economy” – it’s a “green” economy if you have the “green” of money (with apologies to users of other currencies). And that brings me to another conclusion that is counterintuitive. People tend to think that technologies like wind, solar, on-site water capture, and so on will empower the average person and local communities and loosen the power of centralized power structures. But what if the opposite is true? What if all these technologies hand the one percent even more power? Under our current socioeconomic system, what if these technologies allow the one percent to establish their libertarian utopia where they don’t need the rest of us and can tear up the social contract even further than they already have. When it opened in 2005, it became the world's largest completed LEED platinum rated green office building. "If all new buildings were designed in the same standards as the ITC Green Centre, we could eventually cut global energy use and green house pollution by more than 20 percent and save money at the same time," she said. Green Building - good for elites like Hilllary, but bad for us? Keep in mind, this is a country where millions of people still burn dung for heat and live without electricity or a toilet. Ever seen Slumdog Millionaire? And what does this company do? So this wealthy tobacco company just buys everything it needs, trucks in its privileged employees (just like in Silicon Valley) to a gated Elysium while everything outside the walls goes to hell and everyone not serving the corporate bottom line is left to fend for themselves without even basic infrastructure. This is the world the elites are building all over the globe! Behold the endgame of anti-government Neoliberalism. It has already brought about a radical divestment of the U.S. infrastructure, which is literally crumbling and falling down around us. What if things like wind and solar allow this situation to get even worse? Things like sewage systems, public transportation, and the electrical grid are already derided as “collectivism." Who cares about making upgrades to the electrical grid we all use if you can just slap some solar panels on your multi-million dollar home or office building? Who cares about leaks in the water system, if you just harvest your own water? Who cares if the water is safe to drink for people if you can afford to buy your own private water filer? Who cares whether people can afford to light and heat their homes if you can just buy your own private diesel generator or hydrogen fuel cell and have your personal stash of fuel trucked in? It reminds me of Hurricane Sandy, when the general public lived without power for weeks while the rich lived in comfort and ease in their giant McMansions thanks to their diesel-powered generators and solar panels. This is the future. What if what these technologies really do is allow the rich and powerful to abandon society to an even greater extent than they already have? Now that the one percent don’t even need the commons to provide their power or their food anymore thanks to"green" technology, what will become of it - public transportation, public sewage systems, running water, natural gas, public trash collection and snowplowing, and the common electrical grid we're all hooked up to? What will happen to the rest of us unfortunates who find ourselves on the outside of their gated compounds and office parks? Will we even have access to electricity and clean drinking water? If Guragon is humanity’s future then probably not. As the rich collect ever more of society’s wealth, they will continue to dismantle the wider society and put it into private hands, and "green" technology may actually help them do this – gated communities with all the latest “green” amenities – solar electricity, solar hot water, on-site water capture and filtration, air purifiers, locally grown food, etc., while the rest of us will be eating junk food made from processed corn while shivering in the dark, dying of cholera, and getting asthma from the coal-choked air. And the digital panopticon initiated by governments around the world watching us 24 hours a day will make sure even the very thought of dissent is strangled in its crib.So “green technology” may not be the benefit we all assume it is. It may even end up advancing the Neoliberal endgame even further. Now, to be clear, this is a worst-case scenario. For the record, I’m for these technologies and I think they are a good idea to cope with an energy descent scenario as well as climate change. But I just want to highlight the potential dark side to these technologies and how our current political and social arrangements may deploy these technologies in a way which is not to the benefit of most people, and may even be to the detriment of some, as in Guragon. I think we just assume that these technologies will make us all better off without thinking through the deeper questions. P.S. - Please forgive the title of the post - I know it's a sweeping overstatement. I should have probably said LEED is a sham. It's just that in my city, entire swaths of the city are being bulldozed, people are losing their homes and tent cities are springing up, even as massive and expensive condominium towers for the wealthy are popping up downtown like dandelions in the spring, and most of them have the latest "green" amenities and LEED certification (and "certification" is literally all it is - just a plaque in the lobby). My office at work just moved to a new building that is very "green," with duel flush toilets, lights that automatically go off, etc. But there was picketing the whole time it was under construction because it was build with non-union labor. Well, if the workers are poorer, then they can't buy as much stuff to pollute the earth, I guess. This is such a great information for me, because I do an online job that’s why I need fast Internet connection, I search how to boost internet speed then reach at a right place Money Site.